The North Coast Regional Botanic Garden had an Open Day on Sunday 28 May as did other Botanic Gardens from Australia and New Zealand. This open day encourages people to visit Botanic Gardens and find out about the important work they do in plant conservation, research and food security. 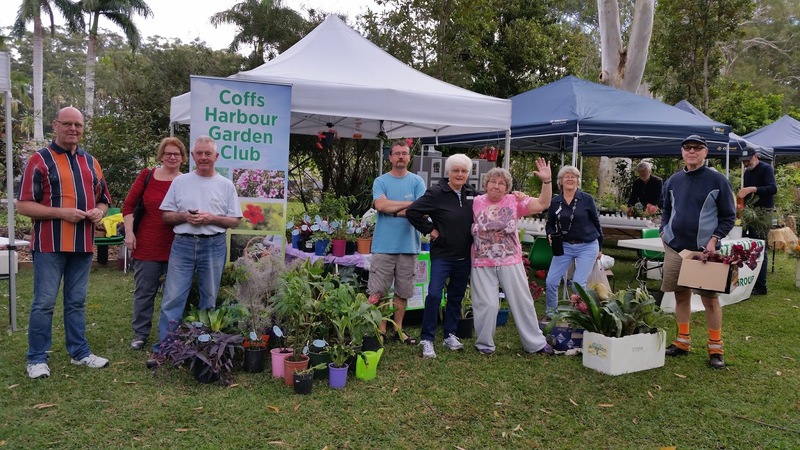 At this year's open day, Coffs Harbour Garden Club (CHGC) had a 'space' to join in the festivities during this special day. It was a shame that the weather perhaps did keep some people away but it was a fun, happy and positive day. As seen in the photo above, there was a good representation of members who attended on the day. CHGC members were asked to provide some 'goodies' for sale and give-away as part of the day. There are CHGC members who are not only 'Friends of the Botanic Gardens' like our club who support 'the Friends' financially, but these people actively and happily give their time to maintain the North Coast Regional Botanic Garden (NCRBG). There is a huge commitment from a volunteer base who really make these gardens possible. The Botanic Garden in Coffs is one of the major regional botanic gardens north of Sydney. The garden covers 20 hectares of Crown Land and is bounded on three sides by the Coffs Creek which is a wide, tidal estuary lined with mangroves. Features of the basic design for the Gardens are of natural forest, rare and endangered Australian species and exotic plants from other sub-tropical regions of the world. The North Coast Regional Botanic Garden also has an extensive botanical illustration index of indigenous species found within the Garden. The NCRBG were opened in the Bi-centenary year, 1988. The Japanese Garden would perhaps be the newest addition with funding from Coffs Council and augmented extensively by local community groups including CHGC. Each year (on the first Sunday of May) there is a Japanese Festival of Children's Day and Koinobori (carp flags) held in the Japanese Garden. This festival is held in collaboration with the Koi Society of Coffs Harbour, Bonsai Society and the Australia-Japan Society along with the NCRBG. Hopefully there were many people who attended this Open Day who went away learning more about the Gardens, supporters and other community groups like CHGC. 'We had a wonderful response to our stall at the Botanic Gardens National Day on 28 May. 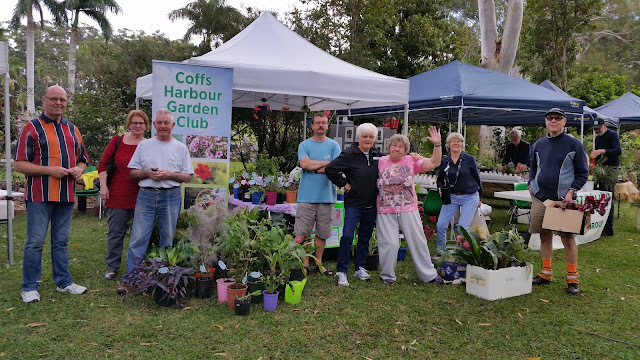 Members potted up some plants and provided cuttings so we could share our gardening bounty with the people of Coffs who came along to the Gardens Open Day. With 7 or so, willing members who braved the weather to man the stall, we had a happy team of workers. The aim of the day was more community participation than fundraising so we sold most things for a dollar or two and gave away lots of little things. We still managed to clear to a little more than $100 after the fee to the Friends of the Gardens for the stall site. Unfortunately the weather Gods were not smiling on us and by about 2:30pm the rain had thinned out the visitors to the Gardens.